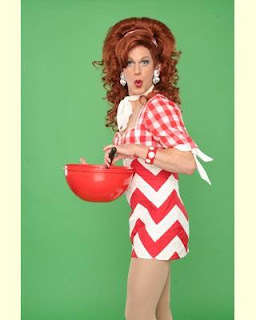 Just Being Frank: Dixie's Tupperware Party! What is that, you may ask? Well, it is a transgendered woman carting Tupperware across the country selling it. Literally, the Tupperware was for sale, or crap as she calls it. The story is that she was let out of jail and her parole officer insisted that she get a job in order to gain custody of her children. To make a long story short, she decided to sell Tupperware after a chance encounter with a classy bowl she was given. And so it began. Dixie took to her friends and neighbors with her shtick and sold Tupperware. A lot of Tupperware. In fact, so much Tupperware that at the annual Jubilee she was the 2nd highest grossing Tupperware Salesperson. "Does any of this have PBA's?" Dixie Responded: "Now lady, I think you mean BPA's, which are a byproduct of a plastics. First, no, we have a higher grade of plastic that does not have BPA's, but second, this Tupperware, it is PLASTIC. Therefore, I do not recommend putting it in the oven(which is how BPA's are released - the microwave is not enough heat). This plastic, it doesn't do so well in the OVEN. In fact, BPA's or not, I recommend you keep the Tupperware crap out of the oven. Have I answered your question to the fullest of your expectations, madam? It was hilarious. I highly recommend it if you are not easily offended, and if you have a sense of humor. If you fall into either of those categories, don't go. And for that matter, why are we friends? Before Dixie's we had another Minnesota adventure this weekend. My good friend Candice was celebrating her birthday by attending something only Minnesota could boast. 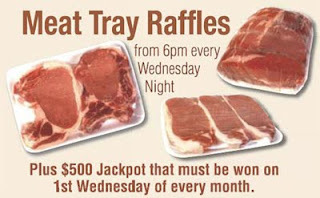 A meat raffle. Now I was a bit confused, but it is everything the name implies. You walk in, purchase a raffle ticket for $1, to be entered in a drawing to win meat. Like real actual animal meat. So very bizarre. No, I did not partake in the raffle section of the program, but I did get a serious kick out of the place. This bar was about 5 minutes from our house, and yet it was as though we were on a different planet. Seriously, this was straight out of a movie. 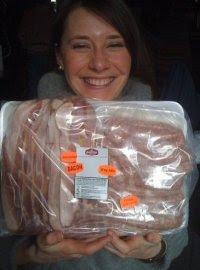 Candice won a giant slab of bacon. Darn, too bad I didn't win the giant slab of bacon. 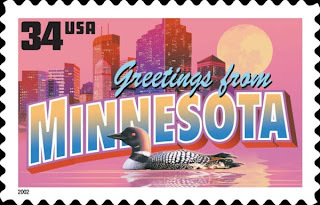 Minnesota, I think I love you. So was the show just like a crazy Tupperware party, but on stage?